SUV is available in three variants T4 (Base), T6 (Mid) and T8 (Top spec) and 4 optional variants T4+, T6+, T6+ auto shift, T8+ and T8+ autoshift. The Tough Utility Vehicle (TUV) is built on a ladder frame chassis from the new Scorpio. The Mahindra TUV 300 is a sub-4m Vehicle to compete more aggressively with products from companies such as Renault, Ford and now Hyundai . The Mahindra TUV300 has rugged styling with high approach, a flat bonnet, bold wheel arches, 184 mm ground clearance and a tail gate mounted spare wheel. At the launch the company declared that the new compact SUV is inspired by a battle tank. Designed in in house by the Mahindra design house, with inputs from the Italian design house Pininfarnia. It is equipped with a new 1493 cc 3 cylinder mHawk80 engine producing 84 BHP power and 230 NM torque with the help of a twin stage turbo. The rear wheel TUV300 is mated to a 5 – speed manual transmission and is also available with a 5 speed AMT (Automated Manual Transmission which Mahindra calls Auto Gear Shift). It is additionally equipped with the Micro-Hybrid technology as seen on the XUV500 and Scorpio to save fuel and reduce emissions. Mahindra has given utmost importance to Fuel Efficiency and has provided an ECO mode and an AC ECO mode to manage engine power and AC usage. Mahindra TUV300 delivers 18.48 Km/l. Mahindra TUV300 comes in a 7 seat configuration similar to Mahindra Quanto with jump seats at the rear. Dimensions – 3995 mm in Length, 1835 mm wide, 1839 mm height with a wheel base of 2680 mm. Equipped with a two tone dashboard, 2 – DIN infotainment system and steering mounted controls. It comes loaded with safety features like airbags and ABS even on lower variants as an option. 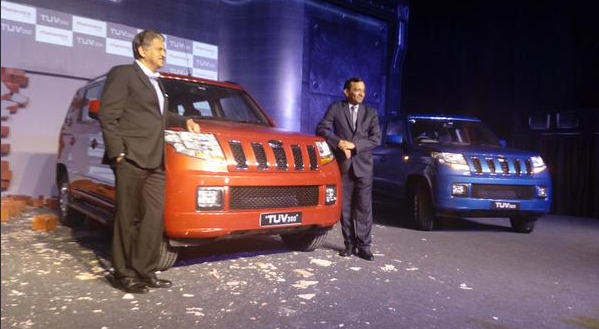 TUV300 is expected to be launched with All Wheel Drive in future.